The Institute of Cost Accountants of India (ICAI) is a statutory body enacted by the Parliament under the Cost and Works Accountants Act, 1959 to regulate and develop the profession of Cost and Management Accountancy in India. The Institute has on its roll over 68000 members and 450000 students. The Institute is governed by the Council responsible for the affairs of the Institute and for discharging the functions under the Cost and Works Accountants Act, 1959 having its Headquarters at Kolkata, Office at New Delhi, 4 Regional Councils at Mumbai, Chennai, Kolkata and New Delhi, Chapters at 95 cities across the country, 9 overseas centers and 119 examination centers. The Institute is on a fast track of growth and expansion. Its approach is ‘People Centric’ and provides for elaborate HR processes including well-defined policies to cater to employees’ growth and aspirations. 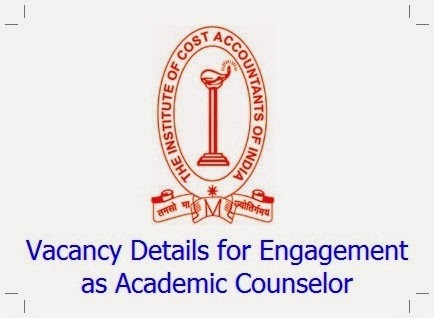 To partner its growth process, Institute is looking for Academic Counselor on contractual engagement terms, to be posted at the Regional Council Offices at Mumbai and Chennai of the Institute. The date of reckoning for computation of eligibility towards age / experience / qualification / etc. shall be 1st,August, 2014. Hence, on the date of reckoning the applicants should possess the requisite qualifications, experience, etc., and should not have exceeded the maximum prescribed age. The candidates shall be required to submit their application online through the ICAI’s Website (www.icmai.in). No other means / mode of application shall be accepted. Only one application shall be accepted from one candidate corresponding to one Login-ID. Candidates should ensure that they fulfill the prescribed eligibility and other conditions mentioned in this advertisement for the post specified. The last date for online application is 31st October, 2014 till 6.30 PM. Please click here for filling the online application. The selection procedure shall be through Personal Interview of the screened and short-listed candidates. The decision of management of the Institute in the screening, short-listing and selection process shall be final. Canvassing in any form will disqualify the candidature. Mere submission of application and fulfilling the eligibility criteria does not give any right to any person to receive a call letter and /or appear for interview. The process of Screening & short listing shall be on the basis of the qualification & experience suitability to the post. The decision of the ICAI shall be final and binding in this regard. Call letter for Interview shall be sent through e-mail. All correspondence with the candidate shall be done through e-mail at the corresponding e-mail id provided/given by candidate only. The Institute shall not be responsible for any loss of email, due to invalid / wrong email ID or corresponding address provided by the candidate or due to any other reasons. Any amendment/modification/corrigendum in respect of recruitment through this Advertisement shall only be communicated through the Institute's website www.icmai.in. Hence, candidates are advised to keep themselves updated by visiting the website from time-to-time for updates, etc. Candidate’s Passport-size Colour photo graph (size less than 300 KB) and signature in black-ink (size less than 50 KB) in jpg format to be uploaded. The candidates should note that the details provided by them in their application are taken on their face value and the onus of proving the correctness and authenticity of the same as and when required lies with them. In case it is found that information furnished by a candidate is false or misrepresented in any manner, the candidature of such persons will be summarily rejected as and when it comes to the notice of the management. The candidates are advised to satisfy themselves fully about the correctness of the information furnished. Candidates employed in Government / Semi-Government / Public Sector Undertaking are required to submit their applications through Online mode. No Objection Certificate from their present employer. Attested copies of all documents in proof of Age, Qualification, Experience, Pay Scale & Salary for the minimum period of experience as indicated for the post should be submitted along with the online application. Original documents will be produced for verification at the time of interview. ICAI shall be free to reject any application at any stage of the recruitment process if the candidate is found ineligible for the post. If a candidate is unable to produce the certificate or documents at the time of Interview regarding their qualification and/or experience, he shall be termed as ineligible to appear for Interview and shall not be interviewed. Clear release order has to be submitted by the candidate at the time of joining if selected for the post. The Institute does not accept appointments on the basis of Deputation/Lien from any organization. Institute reserves the right to alter/change the number vacancies and cancel / restrict / modify / alter the recruitment process and eligibility criteria, if required, without issuing any further notice or assigning any reason thereof.